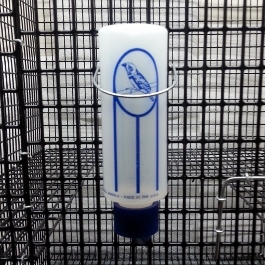 This Sugar Glider Cage, the Colonial Estate 24, is a very attractive cage that gives the gliders lots of room to play. The “Colonial Estate 24″ is one of a series of cages built in the fashion of a Southern Colonial Estate. 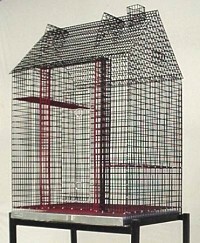 If you have a glider pair named Rhett and Scarlett, you definitely want this cage! This version is 24’x18″x36” and has two columns on the front porch. The porch is recessed into the cage and it features two dormers and a chimney. The gliders cannot get into the columns. There are two shelves in the cage, one on each side at different levels. These shelves make for perching and resting areas for the Sugar Gliders as well as jumping points. 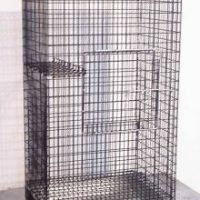 The cage is made of the correct PVC coated wire and will last for years. As in all of TAP cages, this one features a pull out dropping pan for easy cleaning. Made in the USA with all USA materials.